In addition to my New York restaurant reviews, I’d like to share with you my thoughts on random Eastern European restaurants I visit during my various trips. These posts may not always have the depth of my traditional reviews, so I won’t provide any ratings. I’m also unlikely to write about a place if it’s not noteworthy in some capacity. 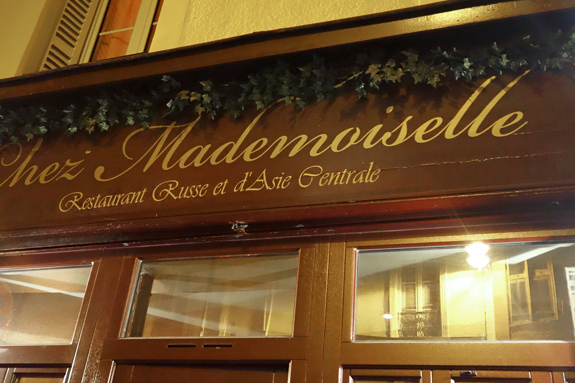 Paris: the Eiffel Tower, the Louvre… and the Kazakh restaurant, Chez Mademoiselle, in the 15th arrondissement. If you’re not convinced, think about this: where else will you eat Kazakh cuisine outside of Kazakhstan? Not in New York. I checked. So while in Paris, why not take a break from the charcuterie, cheese, and eclairs to try something different? So what is Kazakh cuisine, anyway? As it turns out, most of Kazakhstan’s popular dishes are actually shared with Uzbekistan, with only slight differences in preparation. Kazakhstan favors horse and camel meats for festive occasions, apparently more so than its southern neighbor (horse meat is also found in recipes from Tashkent, but that’s because Tashkent is only a few kilometers away from the Kazakh border).